There's a bit of a chill in the air. People are bundling up, adding layers of sweaters, coats, scarves, and hats. The days are getting shorter, and it's time to break out your favorite warm, rich comfort foods to fight the seasonal blues. If you're dreaming of sunshine but can't get away this winter for a quick vacation to the Mediterranean, why not cook your way there instead? 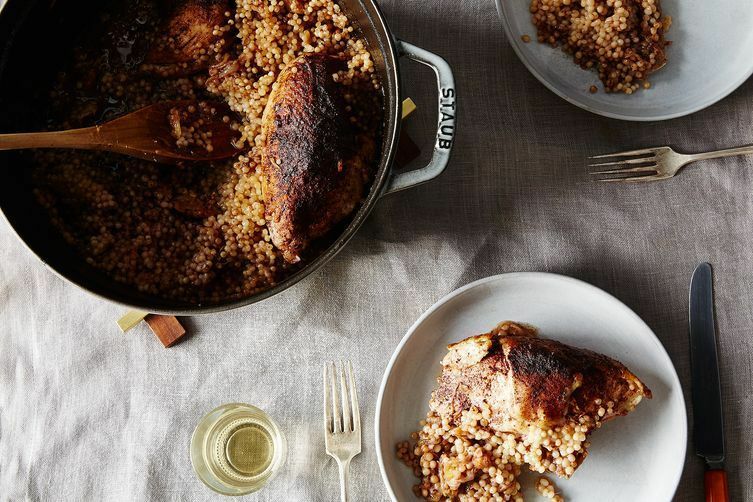 Enter this flavorful one-pot meal of chicken with caramelized sumac onions, preserved lemon, and Israeli couscous. Simply braise, sauté, and bake, for a dish that uses up that jar of preserved lemons that's been gathering dust in your pantry (or gives you the perfect excuse to pick some up). The earthy, tangy notes mix with sumac, cinnamon, and allspice for a hearty, aromatic stew that smells just as good as it tastes. We're assuming you already have olive oil, grapeseed oil (or another high-heat oil, like canola or coconut), garlic, kosher salt, and cinnamon and allspice (from all the cookies and pies you've been baking), but if you don't add those to your list too! With about 45 minutes to dinner, preheat the oven to 400° F and sprinkle the chicken with 1/2 teaspoon of kosher salt. In a Dutch oven, heat a bit of oil over medium heat. Brown the chicken really well, and set aside when done. Don't clean the pot! Take it off the heat, and while it's cooling off, thinly slice the 2 yellow onions and 3 (or more, if you're feeling the garlic tonight) cloves of garlic. Toss 2 tablespoons of olive oil and 1/2 teaspoon of salt into the pot, and turn the heat back on to caramelize the onions. Stir them occasionally, and add a little chicken broth to the pot if it gets too dry. While the onions are cooking, combine 3 teaspoons sumac with 1 1/4 teaspoons each of cinnamon and allspice. When the onions have caramelized, sprinkle about three-quarters of the spice mixture into the pot and stir to combine. Sprinkle the remaining quarter of the mix on the chicken. Stir the 2 tablespoons preserved lemons into the onions, and add the chicken pieces on top. Make a little well in the center of the chicken and onions, and add the couscous. Pour in the 1 1/2 cups chicken broth, and cook, covered, for 20 minutes. Feel free to stand in front of the oven and warm your toes while your kitchen begins to smell heavenly. After 20 minutes, take the cover off and cook an additional 5 minutes. Taste and add salt, as necessary. Serve warm, and save the leftovers to prolong your culinary vacation. What are your favorite weeknight meals to warm up in the winter? Tell us in the comments below! Does this go into the oven at all? Sounds yummy! I assume that the pot goes into the oven after the couscous is added? Hey, thanks, healthierkitchen! And thanks, Taylor, to you too! So glad y'all enjoy this. Cheers!